is delivering must be an exceptionally capable one. The Toyota Coaster was first launched in Japan as the ‘Light Bus’ in 1963. In 1969, the vehicle underwent a redesign and was renamed the ‘Coaster’ – a name still used worldwide for almost 50 years. Globally, Coaster sales have now exceeded an extraordinary 550,000 vehicles. Toyota first introduced the range to Australia in 1977. The release of the updated 2017 Coaster celebrates an impressive 40 successful years in the Australian market, including more than 20,000 sales nation-wide. Toyota Australia sales and marketing executive director Tony Cramb says he is confident the new model will be well received by operators. "New features, improved safety, a stronger frame, larger body and greater interior space will enhance the Coaster’s appeal as a capable and flexible transporter in a wide variety of conditions," he says. The longevity of the Coaster makes it easily recognisable but the new exterior on the Deluxe range does give a more luxurious appearance not seen before in this range. To bring the vehicle into 2017, the company says it revamped its range to be stronger, safer and more comfortable with an updated exterior and interior design that gives it a more sleek and contemporary look. The three-vehicle Coaster range has been realigned to meet shifting customer needs, adding an automatic version to the Standard grade, while discontinuing the manual version of the higher Deluxe grade. All Coaster models are equipped with reversing camera, air-conditioning and heating, tilt and telescopic adjustment for the steering column, and a 95-litre fuel tank. The power comes from a turbocharged and intercooled 4.0-litre turbo-diesel engine that meets all Euro 5 emissions regulations. It delivers 110kW (148hp) of power at 2700rpm and 397Nm of torque at 1800rpm. Standard buyers have the choice of a 5-speed manual gearbox or an electronically controlled 4-speed automatic transmission. The Coaster is now higher and wider than ever before. The body is 70mm taller and 45mm wider with more upright sides for greater interior comfort and space, and more headroom when walking down the central aisle. 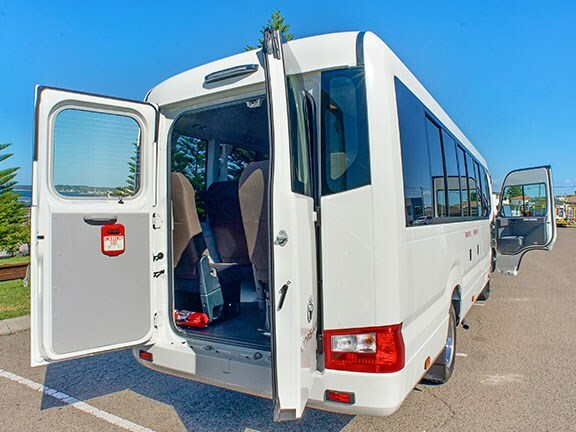 A roomier cabin has enabled Toyota to install an extra seat opposite the driver, lifting passenger capacity to 21 people in addition to the driver. 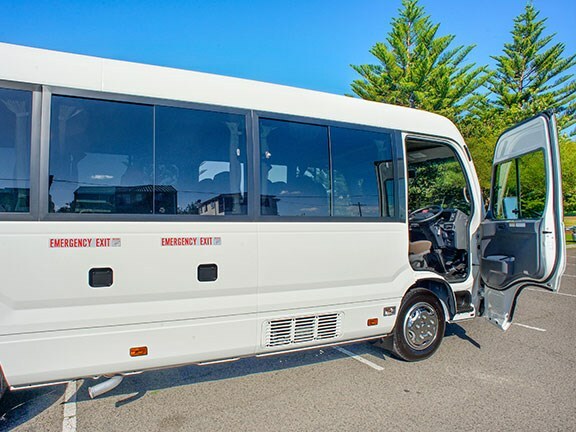 This increase in seating capacity brings the Coaster in line with its major competitor, the Fuso Rosa Deluxe 22-seater, which is 6.7 metres in length – the Toyota Coaster is 6.99m long. The Deluxe model is equipped with an electrically operated sliding side door and is attractively distinguished by a sleek black panel underneath the windscreen. The Standard model retains a body-colour treatment under the windscreen with a folding side door. The Coaster is offered in one colour, French Vanilla, containing PVC and fabric seat coverings for the Standard model and fabric for the Deluxe model. The Coaster’s 21 passenger seats are arranged into seven double seats behind the driver separated by an aisle from seven single seats – two forward and five behind the side door. Integrated headlamps and larger expanses of glass give the Coaster an appealing and improved front design that enhances the spaciousness and increased visibility from the cabin for both the driver and passengers. Larger side windows all have privacy glass so passengers can enjoy the view while maintaining their privacy. The higher ceiling provides generous headroom for passengers, and there is ample space between the seats with plenty of comfortable legroom. 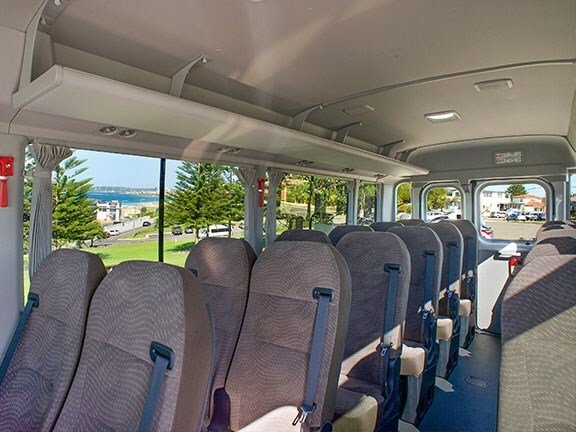 the Deluxe model also features large comfortable cloth seats and window curtains to help ensure every journey is an enjoyable passenger experience. A modernised dashboard layout provides a more functional workspace for the driver, including better visibility and additional storage options, while satellite navigation and the reversing camera make the driver’s job easier. A 6.1-inch touchscreen delivers clean crisp sound throughout the cabin, plus there is a PA system and microphone to keep everyone up to date and informed. Having never driven a Toyota Coaster, I was looking forward to the test drive to see how this bus lived up to its iconic reputation. Being on the Australian market for 40 years means this must be a well-loved vehicle, so I was interested to see why. We headed from Toyota’s Sydney headquarters to Cronulla’s scenic beaches to put the updated Deluxe model Coaster through its paces. Externally, this is a smart-looking bus. The large areas of glass and the black banding on the front give the Coaster a slicker, more upmarket look than previous models – the tinted windows and chrome dress caps complete the look. The rear has large double opening doors that I think may lead to either ramp or disabled vehicle access. As a bus driver, I am always interested in driver comfort and ease of vehicle operation. The dash is very easy to navigate, air-conditioning is easy to operate and worked so well I had to turn it down at one point, and driver visibility is good due to the large amounts of glass. I expected to feel more enclosed being in a smaller vehicle than I usually drive but was pleasantly surprised. The driver’s seat was comfortable and legroom was adequate, and I am tall. I liked the driver’s left footrest – this makes long hours of driving more comfortable. The door control is on the dashboard. To open and close the passenger door, the driver needs to maintain pressure on the button or the door will stop moving. This is a good safety feature as I have driven vehicles where the door controller is a push button and, once implemented, the process cannot be altered until complete. Engine quietness was impressive considering the driver sits beside the engine, so the soundproofing used was extremely successful. I had the driver’s sliding window open and you could hear a slight engine sound as you take off, but that stabilises and decreases as you increase your speed. Once you reach 60-70km/h it seems to get into perfect rhythm with minimum engine noise. The automatic transmission worked well. Going downhill it held the gears without the need to go into top gear, which would require the driver to brake to slow the bus. I was impressed by the overhead passenger luggage racks. In the past, sometimes these racks could be cumbersome and interfere when passengers are getting in and out of their seating, but obviously the additional headroom in this model and clever design ensures these racks work successfully. For a smaller bus with no on-board luggage storage, this is an important feature. The legroom for passengers I found to be similar to airplane standard seating legroom. Again, I am tall, so it would be adequate and comfortable for most. I like the three-point seatbelts. As a passenger, I would be appreciative of the added safety this gives. It was an extremely sunny day and the window tinting was very effective for passengers. There is a large amount of glass, so Toyota has got this right. Overall it was a comfortable and stylish drive. When looking at past models, the updates to a long-running market favourite are sure to impress followers. It’s bigger and better, so how much will that cost? Along with the improved safety features, improved driver and passenger comfort, the price increase has been contained to less than 2.5 per cent. Therefore, from a purchasing perspective it is a large increase in features and improvements for very little additional charge. Servicing is covered under the Toyota Service Advantage, where all servicing is capped at a very reasonable $360 per service. 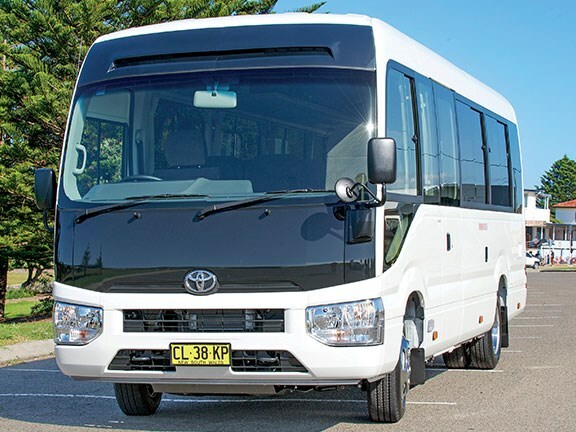 Toyota Australia’s executive director sales and marketing Tony Cramb says the Coaster upgrades would appeal to buyers such as tourism operators, sporting and social clubs, large medical facilities, and conversion companies.